Car wash - booking and reservations. You can use the web-based software to show hourly availability. If you already have your own webpage you can add our online booking system to your own webpage. 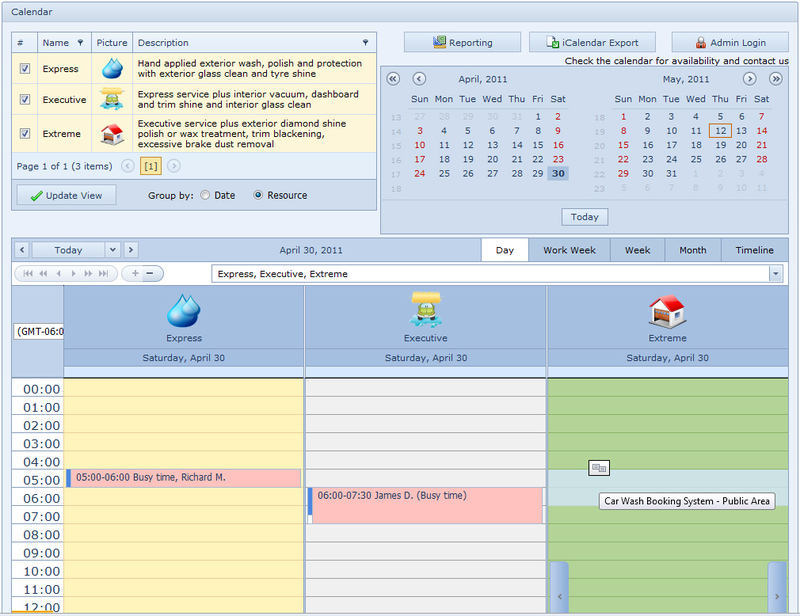 Calendar management is implemented at two levels: Admin Area and Public Area. The calendar gives you a customizable Resource Navigator, new Date Navigator, control over the events overlapping and a mechanism for sharing events. You can put Car Wash Booking System on any web page - HTML, HTM, PHP, ASP, JSP, etc. ...... If you already have your own webpage you can add our online booking system to your own webpage. You can use the web-system to show hourly availability. You will have a single place to manage all calendars. Each calendar may have its own options and administration pages. You can have time slots availability and booking calendar on your website within minutes, installation wizard will set up the system for you. Whether you are a small car wash service, or a large full service chain, we are certain that after using Car Wash Booking System, you'll wonder how you ever managed without it! You're able to bind any picture to a resource, so that it will be shown in its header. Qweas is providing links to Car Wash Booking System 4.1 as a courtesy, and makes no representations regarding Car Wash Booking System or any other applications or any information related thereto. Any questions, complaints or claims regarding this application Car Wash Booking System 4.1 must be directed to the appropriate software vendor. You may click the publisher link of Car Wash Booking System on the top of this page to get more details about the vendor.